Karl Gerich's “Rouennnais A”, first published in 1990, is a 32-card double-ended pack with one joker and an additional card showing a sun/moon motif and the number '20'. 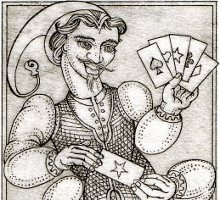 The Aces are highly decorated with the pip in a central circle and two different figures at each end of the card including Adam and Eve, Pierrot and Columbine, Punch and Judy and Moses. The courts are lavishly illustrated and reminiscent of the Russian VP/XP design, but all are original. 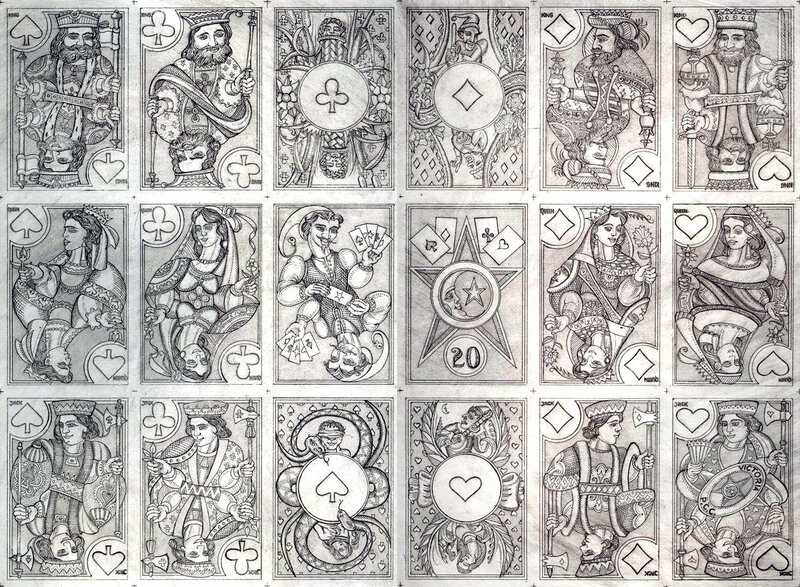 Above: an uncoloured proof sheet of Karl Gerich's No.20 'Rouennais A' playing cards produced from etchings and first published in 1990. The cards measure 49mmx72mm. Images courtesy Barney Townshend. ♠ Tregear, Mike and Daphne, "Karl Gerich: Card Designer and Maker", privately published.